The natural habitat of South American camelids is the altiplano, the high Andean plateau extending through the countries of Bolivia, Peru, Argentina and Chile. Camelids can thrive on the tough vegetation found in this region and are adapted to the high altitude (over 4 kilometres above sea level) and extremes of temperature. South American camelids are distant cousins of the Afro-Asian camels, the Bactrian (two-humped camel) and the dromedary (one-humped camel). There are four species which despite differences in size are basically very similar and can interbreed, although crosses between the wild and domestic species are rare in nature. 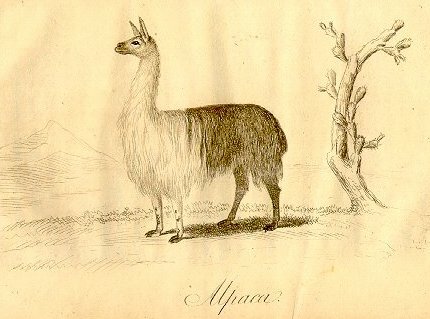 The pacovicuña, an alpaca and vicuña hybrid, is of interest as a fine fibre producing animal. The guanaco and vicuña are now relatively rare wild species but are probably the ancestors of the domesticated llama and alpaca. Alpacas and llamas may have been domesticated as early as 4000 BC (see Evolution and Origin of the Domestic Camelids by Jane C. Wheeler). Llama (Lama glama) traditionally used as a pack animal. Similar to cashmere goats in having a double-coat, the undercoat consists of fine fibres and this is covered by an outercoat of coarse guard hairs. Modern dehairing processes can separate the finer fibres from the coarse hair. Most of the worlds llama population is to be found in Bolivia (about 2.5 million animals with almost one million used for fibre production). There are two distinct breeds; the kcara (light fleece) most commonly used as a beast of burden and the chaku (heavy fleece) used as the main source of llama fibre for textiles. While modern transportation has reduced the importance of the llama as a beast of burden emphasis is now being placed on using this animal as a source of fibre and meat. Alpaca (Lama pacos) are single coated like sheep and angora goats. Alpacas have over many centuries been selectively bred for fineness of fibre, losing both their outer coat and the ability to shed in the process. There are two varieties; the suri characterised by long, straight hair and the huacaya, which has shorter curly hair. Peru has over 80% of the worlds alpaca population (about three million animals). Alpaca fibre comes in a range of natural colours from white through to black and including fawns, browns and greys. The huarizo, obtained by crossing a male llama with a female alpaca, produces a coarser and therefore less valuable fibre than alpaca. Vicuña (Vicugna vicugna) produce the finest and softest underhair. The smallest of the camelids these timid animals were hunted almost to extinction for their fibre. It has been estimated that there were around two million vicuña in Inca times but in Peru only about 5,000 had survived by the mid 1960s. Thankfully due to conservation efforts the numbers of vicuña in Peru is now around 150,000 animals. In some areas the vicuña is once more being rounded up, shorn and released unharmed by the local campesinos. This form of commercialisation discourages poaching since a shorn vicuña has little commercial value. Guanaco (Lama guanicoe) have an undercoat which is finer than alpaca but most of the coat is made up of coarse guard hair. The guanaco has the broadest distribution of the four species of South American camelids ranging from Northern Peru all the way down to the archipelago of Tierra del Fuego in Southern Chile. In addition to fibre both the llama and alpaca are used as a source of meat in South America and their dung is dried for fuel. The EU-funded project SUPREME (SUstainable Production of natural REsources and Management of Ecosystems) was set up in 1996 to address the potential of South American camelid breeding in the Andean region. It sought to assist in developing the production chain of fibre and meat from the domesticated camelids (llama & alpaca) on a sustainable basis. There are sound ecological reasons for increasing the number of camelids at the expense of animals introduced from Europe. Camelids have soft pads on the bottom of their feet and therefore cause significantly less damage to the fragile soil structure found on the altiplano than do sheep and cattle. They have a hard pallet instead of teeth on their upper front jaw giving them the unique ability of tearing grass for eating leaving the roots of the plants intact. In addition, camelids are more efficient in extracting protein and energy from poor quality vegetation than are ruminants and their water requirement is less. Camelids are easier to look after than sheep because they do not have to be guarded against predators nor do they require supplementary feeding. Scientists from the UK (BTTG), Italy, Germany, France, Bolivia, Peru, Argentina, Chile and Ecuador were involved in the project. Members of the project may be seen on the Arequipa page of this Web site. You can also visit the SUPREME Web site for more information and read an on-line summary of the final report. These pages are dedicated to the new friends that I made as a result of the SUPREME project and to the indigenous peoples of South America. Carried out organoleptic testing in Bolivia and Peru using an 'electronic nose' to provide an objective method for the evaluation of meat quality. Taking into account the low nutritional level of the human diet presently available in the Altiplano, Camelid meat could be used to tackle malnutrition problems in the Andean region, owing to its low fat and high protein content. I also developed a Technical Protocol for applying DNA speciation techniques to Camelid fibre and meat identification that can be used in authenticity and quality control testing. Hamlyn, P.F. (1998). Development of DNA primer sequences for the differentiation of camelid fibre/meat from other speciality fibres/meats. Seminario Internacional De Camélidos Sudamericanos Domésticos, Córdoba, Argentina. Hamlyn, P.F., Nelson, G., Asghar N. & McCarthy, B.J. (1999). Identification of speciality animal fibres using DNA profiling. 3rd European Symposium on South American Camelids and SUPREME European Seminar, Göttingen, Germany. Neely, K., Taylor, C., Prosser, O. & Hamlyn, P.F. (2001). Assessment of cooked alpaca and llama meats from the statistical analysis of data collected using an 'electronic nose'. Meat Science, 58, 53-58. Copyright © 1999 - 2002. All rights reserved.